Hey Guys! You've landed on Fort Wayne USA Did you know the factory ships out free all over America twice everyday. See USA Home Page here. Top value supplier of printed sports ground advertising and temporary lift away fence systems for local, community and state fairs. 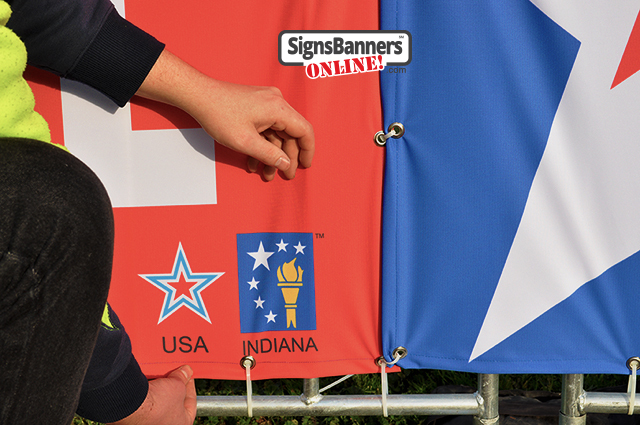 "Using zip tie cutters makes install and removing of event signs easier." With more and more competitive avenues for customers to chase clicks, often it is the reliable and stable standing views that stay top of mind for longer and with internet technologies pushing people to smaller and smaller locative groups it is the community activities that offer the most branding opportunities. Signage has and will always be the most popular and effective 'on the ground' branding at events, in shopping malls, at sporting activities and when large crowds attend such as fairs and festivals. A festival without signage branding is boring. Barricades are deployed during county fairs, community events and sports games for promoting the partnering sponsors, titles and event times, and as a popular use for crowd 'directing' or trafficking. 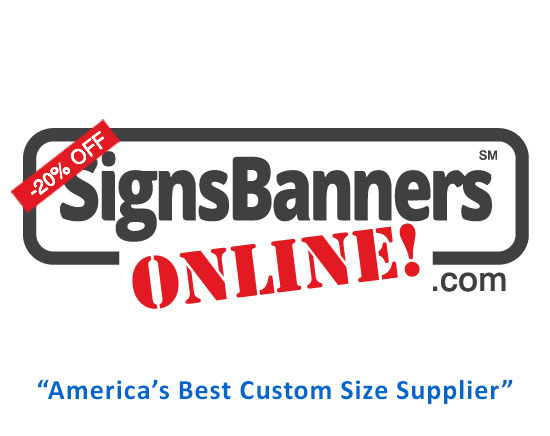 Endless possibilities are availabe now signs are digitally printed onto the substrate, creative minds can think of colorful and exciting ways to portray a clients branding with grand format printing by Signs Banners Online. This is how companies present their modern brands via attention. Clients can call or email for quick response and instantly know the position required to set graphic files for grand format printing and when the product can be ready. We offer outdoor and indoor graphics for retail stores and also are a larger supplier for your re-skin trade show displays suited to the most popular expo systems in America. 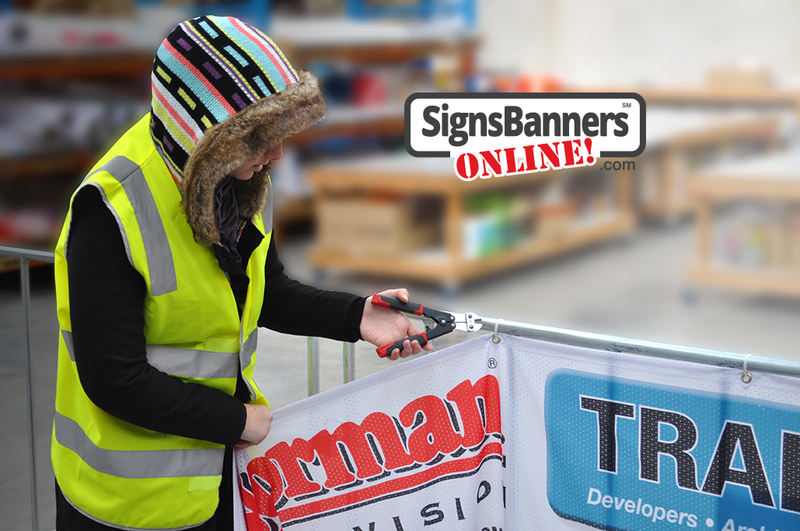 "One of the premium reasons I use Signs Banners Online is because the quality is priority fabric can be laundered". The fabric tension display has taken my showroom to a newer, more modern and inviting level. Designing Your Barricade Identity - Size? The procedure of creating a design for a barricade banner is that you contact your preferred barricade rental company and ask them for the dimensions of: A, Individual panel frames from top to bottom, left to right AND B, The conjoined size of two panels (so that you know the overall 'joined' length of partitioning frames together. The banners are rectangular in shape so make the content of contrasting colors and simple text. Material: Recommended materials include the famous DuraSports mesh, Te-Pro and vinyl banner. Vinyl banner may scratch and will show some reflection so if you're facing sun direction the sign may be less visible. Most common use is a foldable, washable durapolyfabric material such as sports banner mesh for barricades. TIP: Join up to 5 panels per sign print for better looks and ease and IMPORTANTLY less crowd walk thru.